I call this wonderful pizza sauce recipe ‘Fresh’ because it has a lighter, brighter flavor than pre-made, store-bought sauces or long-simmered sauces (which can be wonderful in their own right). I say ‘Simply’ because it requires very few ingredients or preparation and takes about 7 minutes to make enough for about 3 large pizzas, depending on how thinly or thickly you spread it. 1 – Mash up a 28 ounce /793 gram can of whole stewed roma tomatoes. 4 – Swirl in 2 tablespoons of olive oil. That’s the basic recipe. No cooking. You’re done in a few minutes. You’ll love it. You want whole tomatoes because the tomato canners break the tomato seeds in the process of crushing or dicing or puréeing their tomatoes. And broken seeds release a bitter flavor. Three Ways to Mash the Tomatoes. 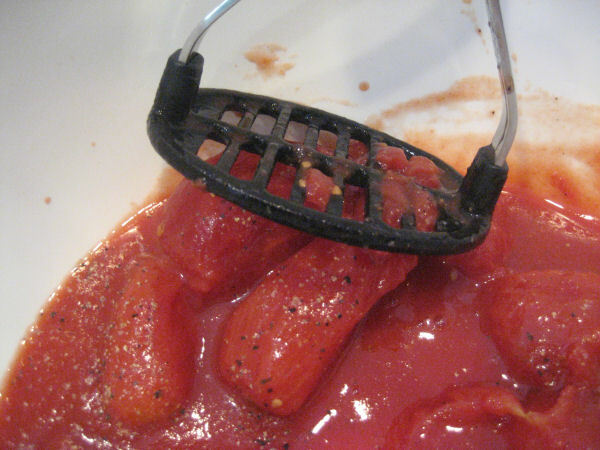 1: You can push your tomatoes through a potato masher. And slice off whatever gets stuck in the masher as you go. 2: A food mill will do the trick. 3: Or you can roll up your sleeve, reach in, and do it by hand. 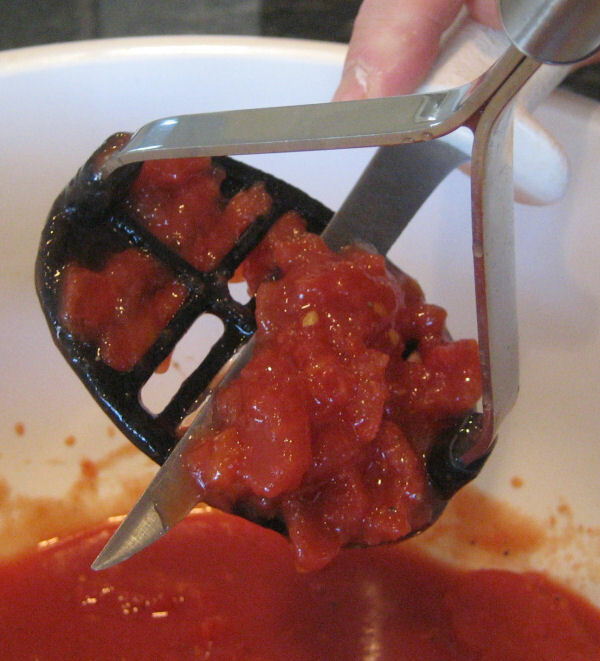 If you’re not squeamish, this is faster and easier than the potato masher. 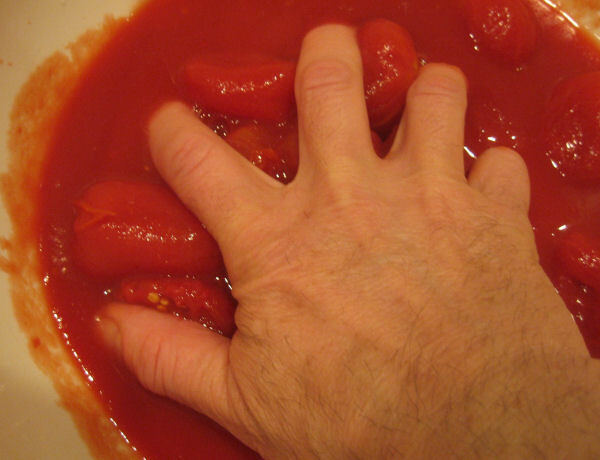 Beware of squeezing or mashing the romas too suddenly. They may squirt. For extra squirt security—or just not to witness the carnage—you can toss a dishtowel over the bowl at least for the initial slaughter. 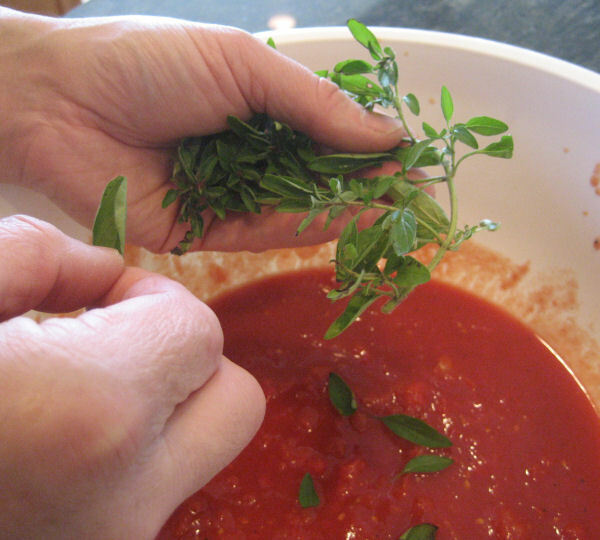 You’ve just done the hardest part of making this fresh pizza sauce. Really. Now just sprinkle in salt, perhaps a little black pepper, and a tablespoon of olive oil. Taste it, and decide if it needs a sprinkle of sugar to round it out. Do this a little at a time. With pizza sauce, too sweet is probably worse than not sweet enough. Add fresh basil or oregano. This really puts the ‘fresh’ in this fresh sauce. Your sauce is ready to make a great pizza! I occasionally also sneak a little red wine into the sauce. Just a tablespoon or so. Please share your experiences and variations with this great pizza sauce recipe. This entry was posted in pizza sauce and tagged homemade pizza sauce, pizza sauce, pizza sauce recipes. Bookmark the permalink.